Creative decisions that are right for you. Taking my time to find the right position. Time to take a look at cutting and fitting the new rear mudguard. 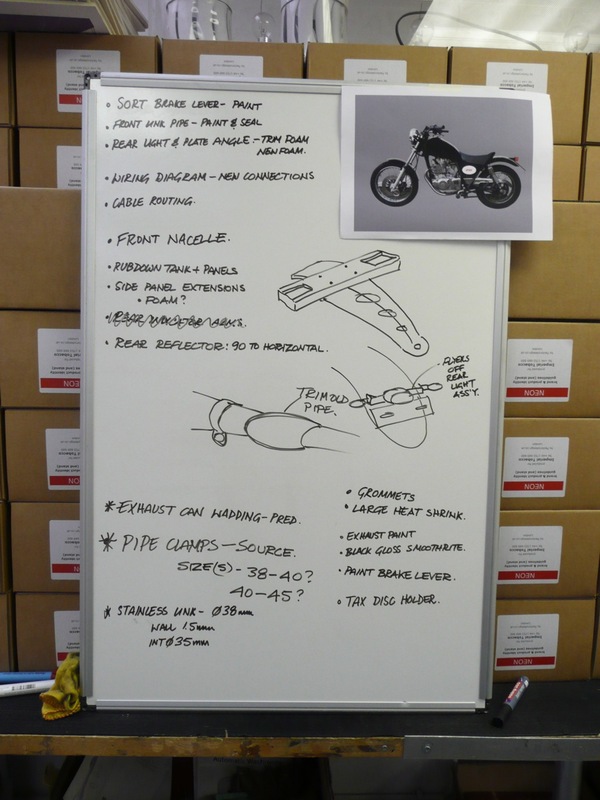 There is much talk in bike building circles about getting the stance of your bike right as a prerequisite for coming up with anything good looking. There is a school of thought that is very prevalent currently to have the line of the bike very flat. That’s to say, the visual line from the back of the seat running through the base of the tank to the front suspension should be pretty much parallel to the ground. Hence you see lots of bikes that are all starting to look the same and share the almost totally flat seat which is almost ubiquitous in its manifestation. This is all well and good if you’ve got the time, money and the need to go down this route. Personally I haven’t. As I’ve mentioned before, without resorting to large amounts of frame modification (read expensive welding bills and jiggery) and spending a whole pile of cash on different suspension equipment, there’s not much one can do beyond a certain point. The creative challenge is therefore to move away from the standard look enough to create difference and come up with something that works with the proportions one is presented with. This can be a lot harder than you think, but it is possible on a very limited budget and is generally a case of taking ones time in positioning, cutting and mounting components. Once you’ve cut metal there’s very little you can do to rescue things, so it pays to exercise patience and adopt a methodical approach no matter how quickly you want the project to be completed. Position set, holes drilled, just the light to mount. Of course, what “looks right” is a purely subjective conclusion. Because these kinds of projects are pretty personal in their nature, the result must first be right for you, in your own eyes. That’s the most important thing really. Decisions you make in a build are always contextualised by a whole host of factors and compromises that one has had to deal with on the journey to the final outcome. Others may not like your final iteration but then invariably they have little knowledge of this context. As a maker, of anything, one has the luxury of knowing that you could change or modify things in future if the urge takes you, but it’s an option that you can reserve to exercise if you so choose. When I first built this bike I made a pile of decisions about how it would look based how I felt about the life it would lead, about practical issues like comfort and durability as much as aesthetic considerations. I reserved the right to change things if I wanted to but generally didn’t feel the need to do much other than periodic tweaking. Now, some time later, it is time to make some changes based on living with it and riding it for a few years. There are still certain things about the stance I can do little about, but these are not a problem. The bike started life as a factory custom and so caries with it some small legacies of that life which I’m happy to live with, like the long forks and the steep rake of the tank. A rather blurry shot courtesy of my iPad, but you get the idea. 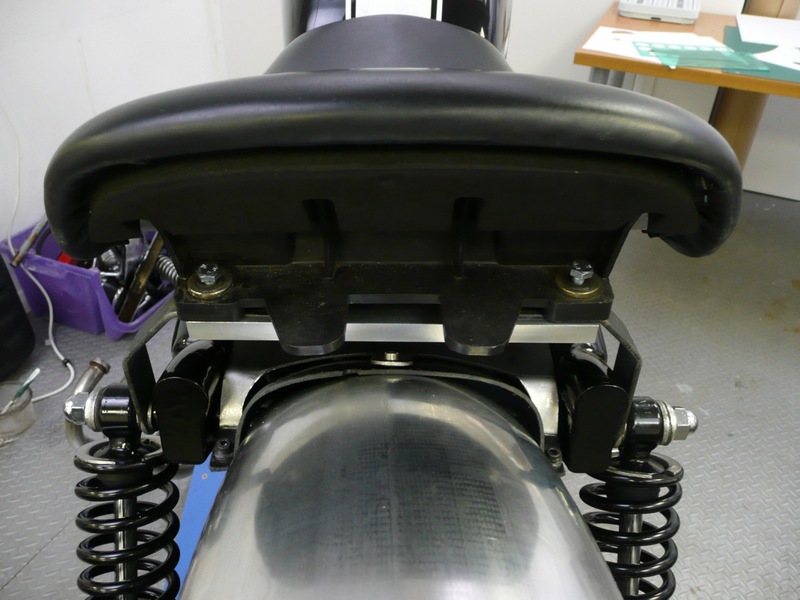 So here are some shots showing the process of getting the new rear mudguard (fender) sitting in the right place, at the right angle in the right way. Once I’d cut the bare rolled section I’d bought to roughly the correct length I spent ages with bits of foam, tape and cups of tea trying it in different positions to get the look I was after. Once I was happy I marked the mounting holes for drilling and returned to the shed for some hole making. The critical factor was getting enough section over the wheel without it looking overly long but still having enough curve available to support the light/plate assembly at the right angle. I didn’t think things had changed much until I held up the new piece next to the old one to see that I’d actually reduced the length by about 150mm, very satisfying. The final shot shows the guard in place with the light mounted and everything else ready to go. The final piece of this refresh is painting the petrol tank, which I’m currently working on a design for and I’ll be posting about that very soon. The 250 build, nearing the end. 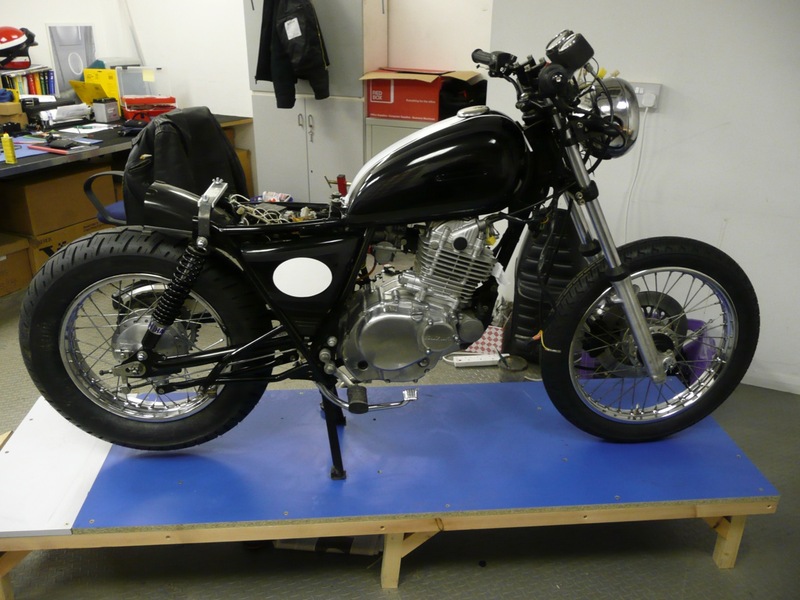 A slight diversion today as finishing the story of the 250 build is way overdue. So some words and pictures of painted bits, metal bits and a nice piece of leather. With three coats of base black applied, a series of white stripes were then masked and added. Everything was left for a couple of days to harden up before a very fine rub over with extra fine paper prior to the lacquer going on. For reasons of cost more than anything I’d elected to use rattle can lacquer rather than 2-pack on all parts apart from the fuel tank, which would be treated to a good couple of coats of petrol resistant lacquer, again from a rattle can. In retrospect I wish I’d gone the 2-pack route but it made the whole paint phase way too expensive, the petrol proof stuff works well but has yellowed in places and was quite tricky to apply evenly. With the lacquer all hardened it was time for a good polish and I can’t recommend Autoglym Super Resin Polish enough. Fantastic stuff and everything was just so shiny shiny. Two important pieces of metalwork remained to be fabricated as all the painted parts made their way onto the bike for the final assembly. I knew the area at the back of the seat needed tidying but hadn’t been able to do much about it without the seat so it was stroke of luck that the seat arrived back just in time from being recovered. 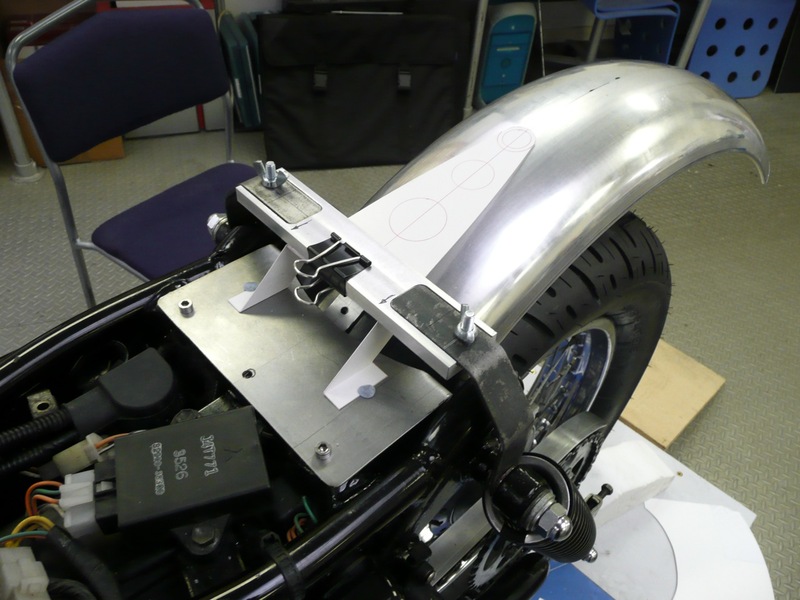 The first task was to make a piece to shut off the open area between the new mudguard and the seat mounting assembly. this then wrapped over the seat mount and formed an infill sitting below the rear of the seat base moulding.As before I worked it all out with thin card first which meant I could create a pretty accurate template for marking and cutting the sheet steel which was cut flat and then bent up in the bench vice. For ages I’d been wondering how to finish off the rear of the seat. Knowing that there would have to be some kind of cover plate didn’t seem enough, there needed to be something else in there to give a more finished look. The answer came to me out cycling one day when I spotted and old bicycle with a little pouch hung from the back of the saddle. I ventured onto the internet to see what I could find for motorcycles. As it turned out, not too much unless I wanted something that looked like it had fallen off the back of John Wayne’s horse, and tassels are definitely not my thing. Taking the bicycle route proved more fruitful and in a fit of extravagance I splashed out on this lovely little number from Brooks the saddle makers. I quickly made up an angle bracket to fix the panel to, mounted to the seat base, and again using some card drew around the profile of the seat and transferred it to another template for cutting. A couple of holes and two slots later I had a neat little cover panel that the pouch straps attached to directly. With these two new parts painted black final assembly could continue apace, my deadline for borrowing the workshop was looming. It’s often the case in more complex projects that the whole can be broken down into various parts. For example, if I’m asked to make a large working model of something I often find that it breaks down into a number of smaller tasks each of which has its own challenges to overcome and in a resultant way its own design brief. What does this assembly need to do, how will it function and how am I going to achieve these criteria. 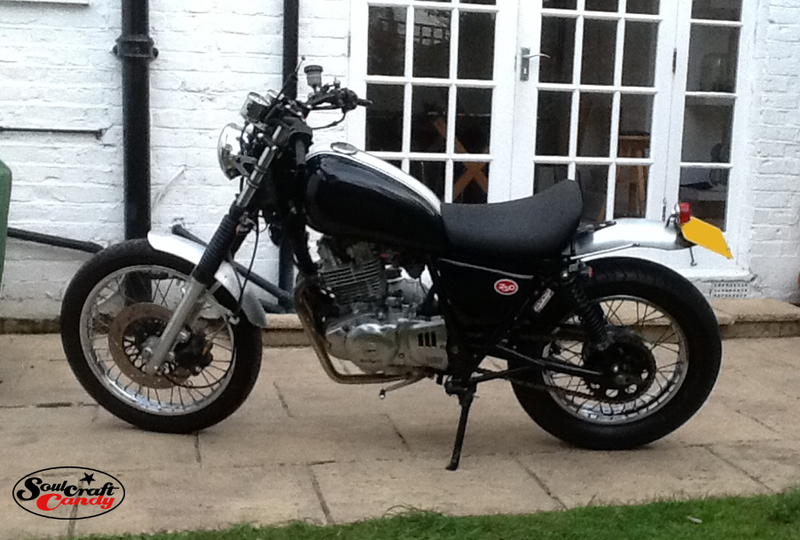 The same was very much the case with the build of the bike. Controls, rear section, front section, exhaust etc all had specific things about them I wanted to achieve, not just visually but also functionally. 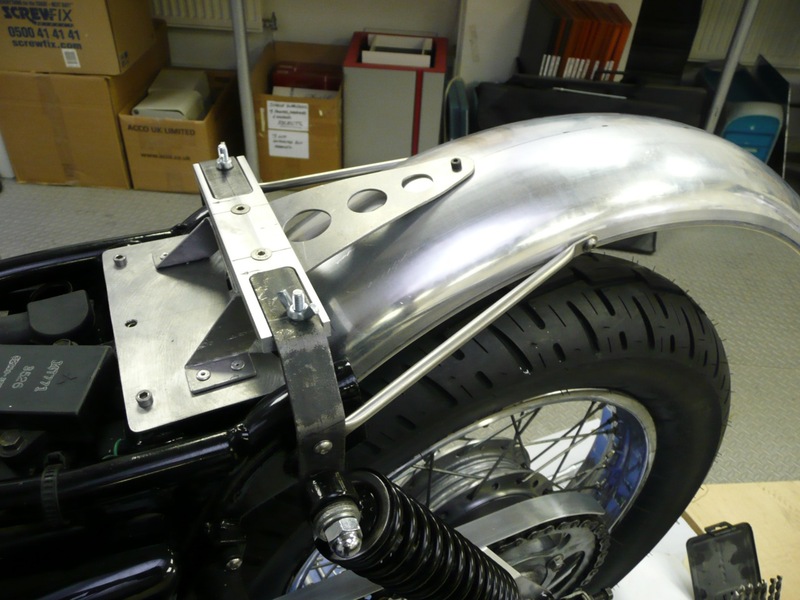 The construction of this rear fender area then, had its own set of requirements that I needed to satisfy. A little brief all of its own. Going back to my original brief that I’d set myself, that the bike was for everyday use, I knew that durability and robustness were important things to consider. British roads can be pretty bumpy and London’s are no exception. The parking bays that we are all invariably required to use in and around town can often be a totally unsympathetic battleground, with people cramming their bikes and scooters into the smallest of spaces with scant regard for any damage caused to your adjacent bike by footrests, handlebars and anything else that protrudes. So with all this in mind I knew that whatever I built would need to be pretty sturdy and resistant to bending and scraping. This rather delicate piece of rolled aluminium fender section was going to have to be turned into something a bit more substantial. Another habit that I’ve got into on any job is to have a sketch book or pad handy at all times during the job. This helps me to organise workflows, keep track of component purchases and budgets and the like. But it’s also very handy for sketching out ideas and thoughts when trying to solve specific problems. Importantly it enables me to keep everything in one place, there’s nothing more frustrating than constantly having to find loose bits of paper in a pile, especially the one that often manages to fall behind or under a workbench. Similarly I also go and buy some of those plastic document envelopes from the stationers for collecting all sales receipts, brochures and technical sheets one invariably accumulates during a job. 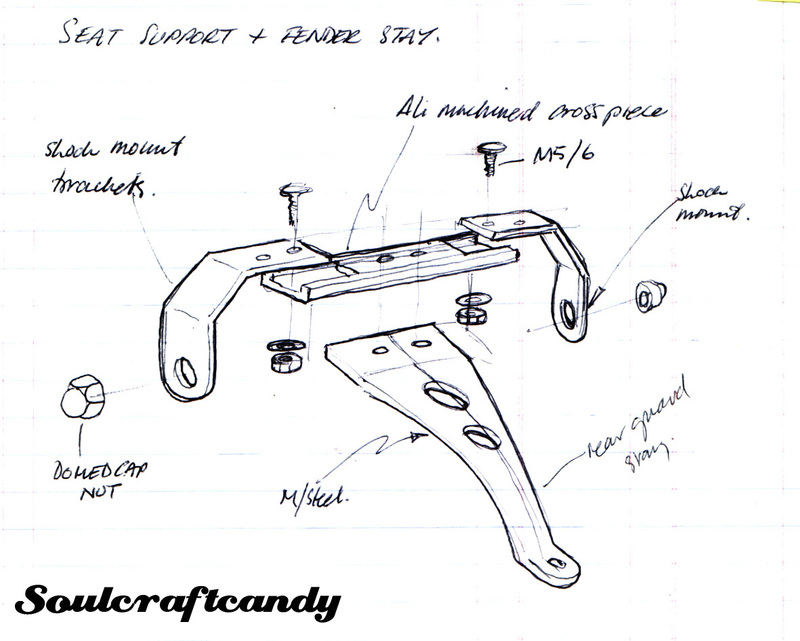 These three sketches above are from my notebook and show my thinking about how I could overcome the stability and strength issues with my rear fender. The top two sketches show a rough idea of the kind of upper support I wanted, a tapering finger of material with some holes pierced in it for a kind of lightweight look. This would be coupled with a large strip of slightly heavier gauge steel than ran down the centre of the underside of the fender piece. 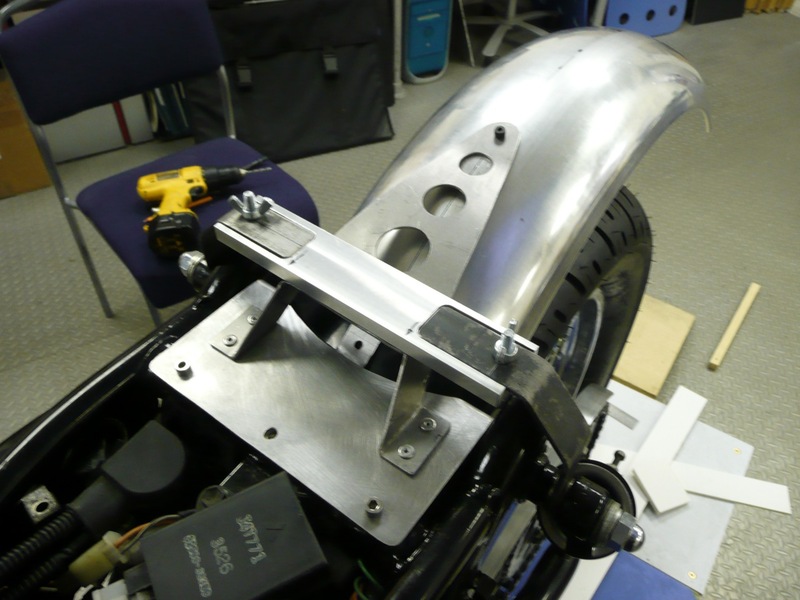 This strap would mount at the front end via a hole to match up with that on the mounting plate and at the back end two spaced holes would line up to accept the two mounting bolts passing through the fender from the rear lighting cluster and numberplate mount. Like a kind of backbone to the whole affair. I reckoned this would contribute significantly to the rigidity of the fender piece both in a vertical plane and horizontally. There was still the issue of dealing with any twisting action though. 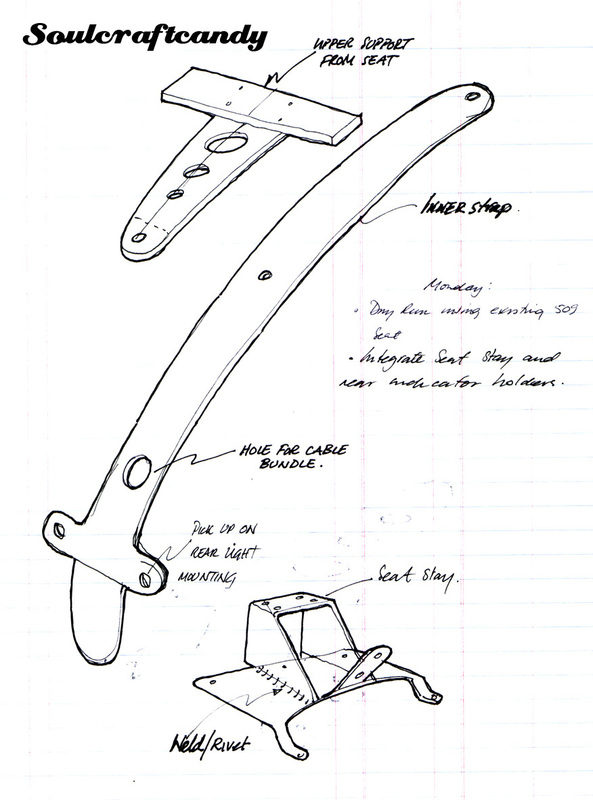 The final sketch is me investigating how to fix the upper mount to the assembly already in place for holding the seat in place.The first thing to do then, was to translate my sketched ideas into three dimensions and see how it worked. No batteries required, just a brain and a pen. Before I get on to that it’s also worth mentioning that one of the best tools to have in your work space is a dry wipe board. It doesn’t matter what size it is but, my advice is get one if you can. Working in conjunction with your notebook it assists in organising what you’re doing and helps you prioritise your tasks. I find it invaluable. Its perfect for creating lists of things to be done and in what order. Time and time again you read in magazines about other peoples builds and often they mention the value of such a device and attest to the immense sense of satisfaction to be gained by erasing jobs on the list as you go and replacing them with new ones. Two other great things about it are that you can sketch on it at an enlarged size to really work things through and, if you place it sensibly and write large enough, you can see it from anywhere in your work area. I picked up this one from a discount store for a couple of pounds. Some of the wall mount parts were missing, hence the price, but worth every penny. Whilst I had been deliberately distracting myself I had been fiddling around with a number of other things as well. Stripes of white electricians tape had appeared on the tank to see how it would look, various graphic devices had arrived on the side panels and I’d been playing around with ideas for a front fly screen. So now I want to tell you how I made the rear fender. What I also want to do is try and make it a bit more interesting than just a plain old description, blow by blow as it were, of cutting bits of metal and bolting them together. It’s something that’s started to creep into my thoughts as I try and create more posts for the blog. As you well know from very early posts, or you may have read my “About” page, I spend a great deal of my professional time making models and prototypes for people. That process invariably involves employing lots of techniques and quick fixes to achieve particular results. So I’m always thinking about how I could pass on any of these things to my readers in the way of useful tips etc. 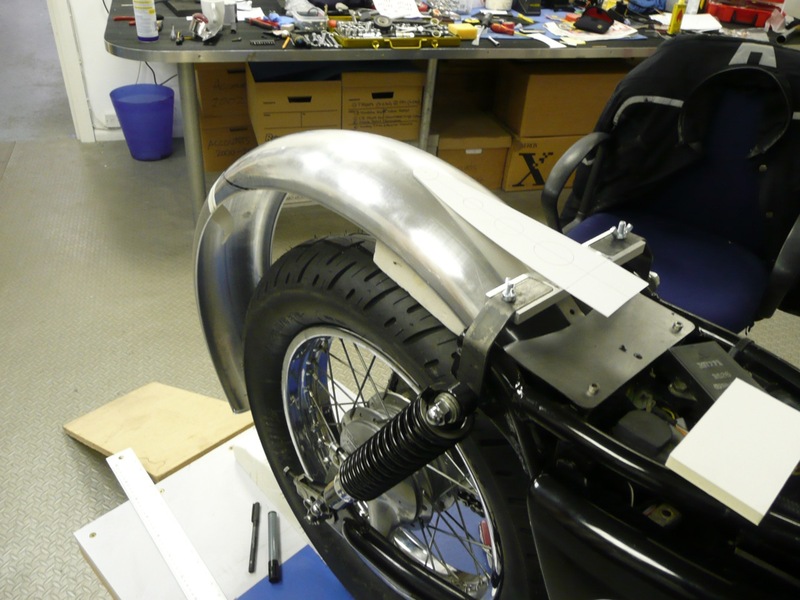 The fabrication of the rear fender seems a great place to try and communicate some of these things. So here goes, though having said that I may very well get to the end of this bit and not passed on anything at all. The following piece will certainly contain some. As you will have gathered, my start point for this next phase of the build is a bike frame with the two rear seat support stays cut off and a moulded plastic inner fender which I’m retaining to help keep all the road crud out of the back of the bike as I’ll be using it in all weathers. I’ve also got my hands on a large rolled section of aluminium mudguard, sold by those wonderful folk at Burton Bike Bits. I’ve chosen a rounded section with a rolled edge, for neatness. It arrived as almost a full circle of material. The plan was to first figure out how to mount it securely, I didn’t want it flapping about as I bounced down London’s crappy roads, and then to decide on a length that would offer good protection and cut the piece to size with the end shaped how I wanted. 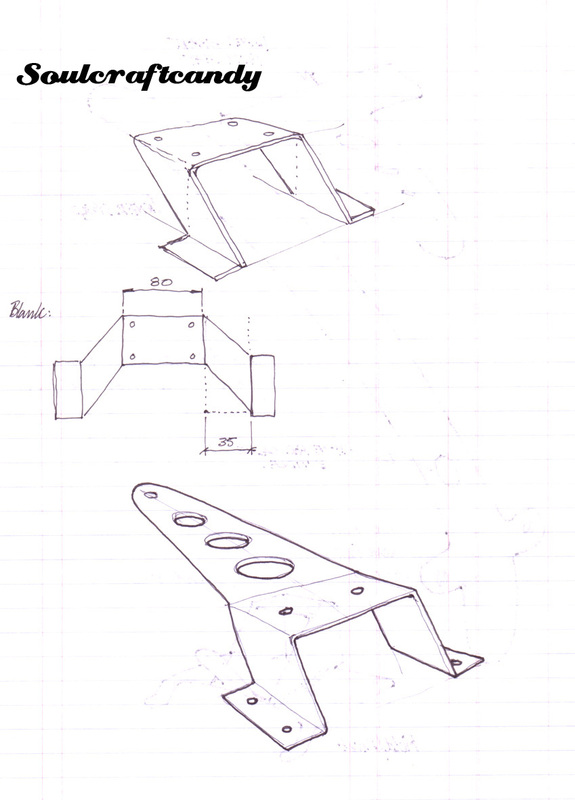 Mounting plate attached to cross member. 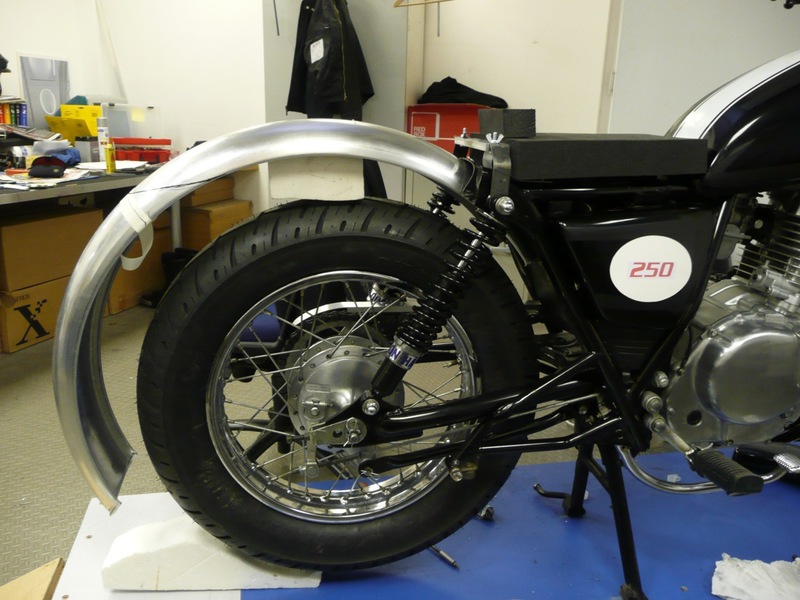 The first task was to secure the plastic inner guard, which only loosely clips to the frame and relies on the original mudguard for support. Conveniently nearby is a cross brace on the frame under the seat so I made a plate with a protruding finger of material out of 16 swg mild steel sheet that I could secure to the cross brace and to the plastic guard. I couldn’t weld at this time, and only now can do rudimentary stuff with a MIG welder, so I had to screw the plate in place. I always find putting threaded holes directly into thin walled tube a bit of a fudge and on this occasion used what I know as Pull-serts or Grip-n-serts. These are threaded inserts specially designed for creating blind threaded holes in sheet materials. Very handy things, available in most thread sizes and they give a great result where you don’t have enough material to provide a decent thread length in a tube wall, sheet thickness and even extrusion wall. Three of these at M5 size into the cross member worked a treat and provided a very sturdy mount for my plate. A happy coincidence was that the plate also formed a neat compartment under the seat for the electrical connections to the rear lamp cluster. So now I had the plastic guard secured and with a single central hole drilled, a place to mount the rear guard metal section enough to allow me to start to think about its length, angle and subsequent mounting points. I’d cut the big piece of rolled section down a bit to make it more manageable and found a handy lump of scrap modelling foam that I could sit on top of the tyre to support the piece while I decided on angle and length, helped, as you can see in the photo by a piece of duck tape on top. Anyone familiar with a retracting tape measure knows that curved sections of sheet material are only rigid in one plane and waggle about like no ones business when you least want them to. 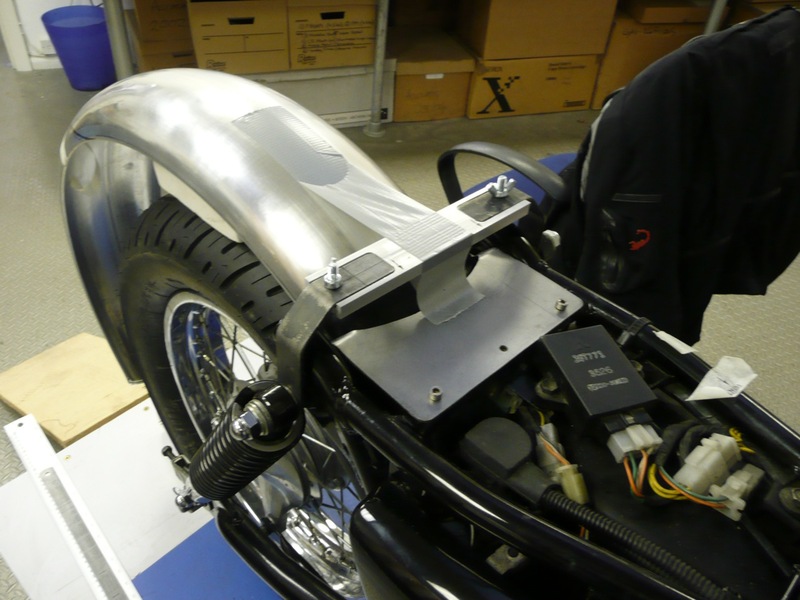 The same applied to the rear fender section so the next challenge was to come up with a way of preventing that action occurring at the back of the bike. Time to get the sketch book out. I’m not sure if Pull-serts live up to being a top tip but it’s a start.